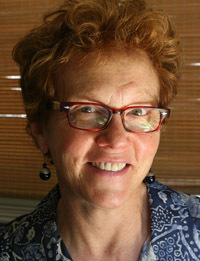 Mary Beth Pudup, director of the Community Studies program at Oakes College. The major will be based at and administered by Oakes College and directed by Mary Beth Pudup, associate professor of Community Studies. It will accept up to 70 new undergraduate students each year who will take courses from a variety of departments in the social sciences and humanities in addition to the foundational Community Studies core curriculum based at Oakes. Community Studies 2.0, as Pudup calls it, will focus on urban studies and health justice, two topical areas with sustained student interest and enduring social relevance, she said. Community Studies will also collaborate with a new Oakes College undergraduate certificate program called Service Learning and Community Justice, said Oakes Provost Kimberly Lau. "We will work together to offer our students the opportunity to put Oakes' mission and values into practice through service learning," Lau said. Lau also pointed out that having Oakes serve as the programmatic home for Community Studies helps the college extend its academic course offerings by sharing resources. Oakes and Community Studies will share a full-time lecturer who will develop the Oakes certificate program, teach for Oakes and Community Studies, and ensure that service learning experiences are contextualized within an academic framework emphasizing social, historical, and political analysis, Lau said. "Bringing the major back is exciting," said Herbie Lee, vice provost for academic affairs. Lee said he hopes Community Studies will become a model as UCSC explores establishing other interdepartmental majors sponsored by the colleges. "It opens up some new opportunities," he said. UCSC’s Academic Senate Committee on Educational Policy (CEP) approved the reinstatement earlier this month. The innovative Community Studies major was founded in 1969 around the then-novel principle of integrating experiential education, in this case a six-month, full-time field study, with campus-based classroom learning. Afterward, students would complete a senior thesis related to their field study. It was both a highly popular and signature major in the learn-by-doing ethos of undergraduate education at UC Santa Cruz. "In its research, teaching, and service, Community Studies encourages thoughtful discussion of society and civic engagement with the varied strategies for seeking social justice and meaningful social change," Pudup said. The CEP suspended the major in spring 2010 for at least two years, citing concerns about the major's viability after state budget cuts to UC and UCSC. “Faculty have not been able develop a satisfactory plan for supporting the major with the reduced resources at their disposal,” the committee said at the time. Campus Provost/Executive Vice Chancellor Alison Galloway has approved funding for three years. She said her office will evaluate funding at the end of the three-year period to assess the level needed to continue. Community Studies has more than 1,000 alumni who work in an array of professions and occupations. Pudup notes that many have found a particular niche in the nonprofit sector. Nearly 100 have founded public service nonprofit organizations, most based in California, and hundreds more serve on boards of directors and in executive director positions, she said.